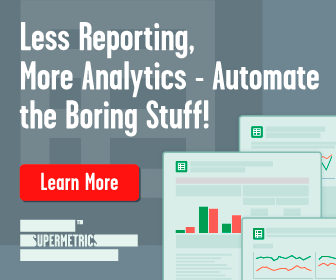 Supermetrics, a subscription-based service we have worked with extensively and recommended from the start, makes the consolidation and reporting of all of your company’s most important metrics and KPIs seamless. Perhaps our favorite feature that Supermetrics provides its users is a wide variety of ready-to-use templates. These templates cover a variety of topics, including several dedicated solely to Google Ads. They are sure to save you and your employees valuable time building reports from scratch in Tableau or Excel. In this article, we’ll discuss our three favorite Google Ads templates available to Supermetrics subscribers that take all of the head scratching out of understanding your paid marketing expenditures on Google’s expansive ad network and ultimately save you time and money. Without a clear understanding of how your Google Ad campaigns are performing, how can you expect to optimize and take advantage of perhaps the most powerful marketing tool online? Well, quite frankly, you can’t. It’s critical to have a report that lays out the necessary metrics in a logical and easy to comprehend manner to help you see how your marketing efforts have evolved (hopefully positively) from month to month. This template from Supermetrics does just that. This template displays key metrics such as Clicks, Impressions, Cost, CPC, CTR, Average position and the Conversion among other metrics, that will help you analyze how your account is performing. Supermetrics reports the performance of the account holder’s Google Ads performance by month and year, as well as year-over-year and month-over-month changes. Furthermore, it breaks down the account’s performance by network, device, campaign and country, and provides clear charts for all of these. Naturally, all of the data this template provides can be found throughout various pages within Google Ads itself. However, this template offers the convenience of having all information located in one central document. We know how much your time is worth. There’s no need to waste it clicking and scrolling through pages on end when it could all be in one spot! Because the data is only displayed by month and by year, this template is not recommended for day-to-day or week-to-week changes, but rather as a tool to examine your business’s Google Ads performance on a macro-level. The simplest of of the three top Supermetrics Google Ads templates, the Keyword Heatmap Tool, makes the visualization of individual keyword performance a breeze. This templates allows the user to quickly pinpoint all keywords whose performance is above or below the business’s KPI targets and act correspondingly. To use this template, one simply enters the desired time frame of the data and a variety of KPI targets including CTR, CPC, CPA, Conversion Rate and Bounce Rate. After this information has been entered, each keyword will be listed directly below along with all of the important metrics. Each metric belonging to each keyword is assigned a color on the color spectrum ranging from green to red, signifying how well the keyword is performing in relation to the KPI targets set above. If the color of a specific metric is dark red, we would recommend taking a closer look at what is causing the keyword to perform so negatively or, if you don’t have the time, send us at Kemb a message. If everything is green, that’s fantastic. Keep doing what you have been doing in the past, but be sure to continually monitor the performance in case something changes! Interested in Supermetrics? Get a free trial here! This template is exclusively dedicated one metric that many may either overlook or not fully understand. The Quality Score is an estimate of the quality of your ads, keywords, and landing pages. The significance of this metric is, however, much more than a simple marker of presumed performance to reference every once in a while. A higher quality advertisement and/or keyword represented by the Quality Score translates directly to lower prices and better ad positions. For this reason, we always audit our new clients’ Quality Score right away. We implore our clients to always monitor their Quality Scores closely because a low Quality Score is certain to lead to disappointing ad performance and extra money being spent on ads. Fortunately, Supermetrics has put together and offers its subscribers access to a template that makes keeping an eye on your ads’ and keywords’ Quality Scores a very easy task. After setting up the Quality Score template, users are able to select their time frame and immediately have access to all important Quality Score metrics. Subscribers are able to see their account’s average Quality Score and percentage change from the past time period among other more sophisticated metrics. Below, there are a plethora of charts and graphs, each clearly displaying a helpful metric, including, but not limited to, the number of keywords in the company’s Google Ads account by Quality Score (1-10) and a breakdown (above average, average or below average) of the account’s ads’ landing page relevance, quality score and predicted CTR. The final and perhaps most convenient aspect of this template is the ability to quickly set filters and be able to identify poorly-performing (or well-performing, depending on what your intentions are) keywords from the hundred or thousands currently active online. Just this one reporting template has the potential to increase your company’s ad performance and for this reason it’s on our list of top Google Ads templates provided by Supermetrics. These three Supermetrics Google Ads templates are only a small sample of what this invaluable service can provide to alleviate a lot of the difficulties surrounding Google Ads reporting that many companies face on a daily basis. We encourage you to visit the Supermetrics websites and inform yourself of all that they offer. At Kemb we work with these templates every day! We are always looking to find the best business intelligence and reporting solutions for our clients and we keep coming back to Supermetrics. As experts who are passionate about our work in this field, it comes natural to us to want to support our clients with every need they have in the business intelligence and data science realm. If you’d like help getting started with Supermetrics or finding the perfect solution for your budget and maturity of business, Kemb would be happy to assist! Providing reports and deriving actions from data, we will discover areas to help your business to take the next step. We’d love to hear from you!